X-Man is in the driver’s seat and even more dangerous than before in Uncanny X-Men #9, by writers Ed Brisson, Kelly Thompson, and Matthew Rosenberg, artist Yildiray Cinar, colorist Rachel Rosenberg, and letterer Joe Caramagna. This is the penultimate issue of the X-Men: Disassembled storyline and the creators pull out all the stops to give readers an action packed ride. 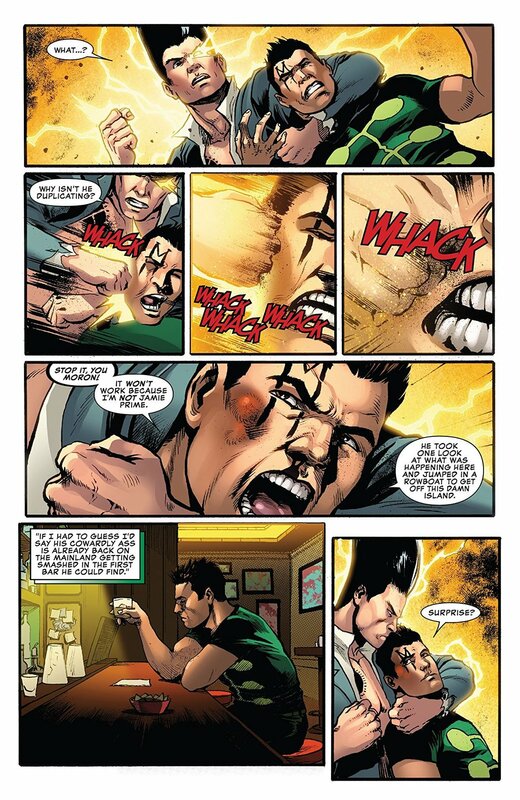 X-Man has taken over Legion’s body and has completely lost patience with the X-Men. He enters Storm’s mind and makes her into a Horseman of Salvation and they attack the X-Men. As the team fight back, Armor, Glob, and Rockslide put a plan into effect to take the Horsemen out of commission, while Jean calls for reinforcements. Beast finds out why Anole gave away his mutant vaccine, before Pixie shows up to summon them away. Back at the fight, things go awry until Beast arrives with help. This issue is an action packed banger, plain and simple. It works rather perfectly, really. The X-Men were going to strand X-Man, perhaps even the younger members who got pulled in with him, in a version of the Age of Apocalypse. The fact that he flips out and goes all in on destroying them makes sense. He tells them that up until this point, he hasn’t tried to hurt them and that’s true… from a certain point of view. He tried to kill them at first, but it was in the most humane, quick way possible. From his warped viewpoint, that wasn’t trying to “hurt” them. Now, he’s decided that they need no more of mercy. Honestly, while his opinion that he hasn’t tried to hurt the X-Men is delusional, his opinion of their actions against him, stranding him in a place that has fueled his nightmares, sort of warrants his freak out. The writers have painted him as delusional, but here they show they he isn’t completely insane. It makes him a bit more sympathetic of a villain, which is good. The best X-villains usually contain an aspect that is sympathetic. The creative team keep things moving throughout the book. This issue is very fast paced, but it isn’t so fast that the reader feels like they’ve missed something. However, it doesn’t skimp on the drama, giving X-Man plenty of time to give his reasoning. The only thing that does feel out of place is the exchange between Beast and Anole. The mutant vaccine subplot hasn’t been a very important part of the overall storyline and it feels out of place to include this plot in this issue. It’s a nice scene, but it’s also one where anyone who knows anything about the X-Men and their personal struggles could guess why Anole did it. The good thing is that even though it’s definitely an out of place moment, it doesn’t ruin the flow of the book at all, as the ending of the scene plays into Jean’s plan. So far, Yildiray Cinar has been the weakest of the artists on this book, but this issue he steps big time. Before, his line work and detail would suffer, but in this issue, almost everything is crisp and detailed. That makes a big difference in an issue with such an emphasis on action. These scenes need to be kinetic and exciting and he delivers here, big time. As always, Rachel Rosenberg’s are wonderful. Her palette is darker in this one and it helps inform the reader on a subconscious level that what’s going down is serious. Uncanny X-Men #9 delivers big time. This story arc has had some ups and some downs, but the creative team has righted the ship. They deliver a fast paced, action packed comic with this one, while still hitting all the right emotional spots. The Beast and Anole thing seems a bit out of place, but in the end it works toward the overall plot. As far as penultimate issues of a story arc go, this one is nearly perfect.